It’s been exactly five years since I moved to university for the first time, and one year since I moved to a different university to do my Masters. So there wasn’t a more fitting day than this extremely rainy, dull Saturday to write this blog post. I was inspired to write about this when I saw something on twitter the other day. 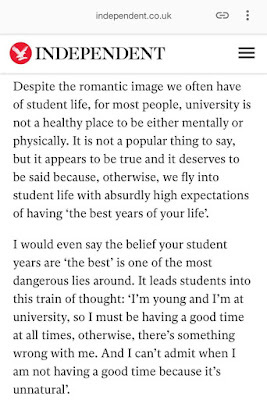 It was a screenshot from an article on The Independent about the unrealistic and even potentially dangerous expectations we set up for ourselves when we go to university. This really resonated with me and I thought wow, finally somebody has put into words what I’ve felt the two times I’ve moved out to go to uni. At 18, I went to university only a 25 minute train ride from home. I still decided to move out and stay in student halls because that’s just what everyone does, right? That’s the norm. I thought that being so close to home would help because it wasn’t like I was halfway across the country. Wrong. In fact, this sort of made it worse. I started thinking why can’t I just go home at the end of the day instead of back to this flat where I sit alone in my room and live with people who I’ve never met before in my life? But of course, because it’s what everybody does, you just have to deal with it. Just as mentioned in the article, I had those exact thoughts. I’m 18 years old, I’ve just moved to university with so many opportunities to go out and party, to make new friends, the world is my oyster. My mind had built up this expectation that university is a magical place where you make best friends with your flatmates and have slumber parties with pillow fights and just generally have the time of your life. So why was it that all I wanted to do was go home? Why did I feel like crying all the time because the feeling of homesickness was so strong? Why did I get back from lectures and sit alone in my room feeling like I was the only one who was taking too long to make friends? Because my expectations were too high. They were unattainable. Unreal. I started to think that everyone else was making friends and I wasn’t, and that there must be something wrong with me because everyone I passed in the hallways of university was smiling and laughing while I was sitting eating my lunch on my own. I thought, how have some of these people moved hours away from home and are absolutely fine while I’m only half an hour away and I’m not? But as the article suggests, I couldn’t admit I wasn’t having a good time because it’s ‘unnatural’. My whole family are proud of me, I’m paying for this accommodation, I’m supposed to be having the time of my life. All these thoughts niggled my brain and it’s just not healthy to think like that. I have always been an overthinker, granted, but I truly do believe the unreal expectations of university contributed a lot to these thoughts. I’m not saying that university wasn’t the best time of my life. My first year was incredibly tough at first but I did make friends. I enjoyed my course so much and when I was at actual university in lectures I did have the best time. 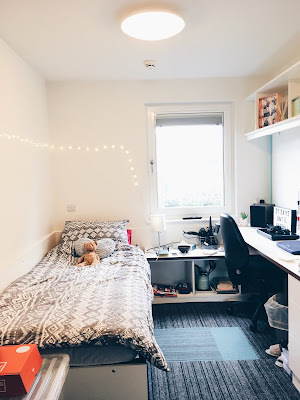 I’m just saying – admitting – that the romanticised view of student living isn’t all it’s cracked up to be. This is of course my personal experience and I know some people are the opposite. I’m not trying to scare anyone who may be going to university, because everyone is different and some people might adore it. I’m just telling my story in the hope that it helps someone out there to know they’re not the only one that feels this way. Because when I was in that position I believed I was the only one. Of course, I did get through my first year. In second and third year, I lived at home and took the train every day. I was extremely lucky I was able to do this, and it contributed so much to my overall happiness. I found it was the perfect balance, and knowing I could go home at the end of a long day at uni was the best thing for me. At 18, what makes us think that we are suddenly old enough to be thrown into a flat on our own with people we have been chucked together with, and cope with life on our own, in a brand new city? Because for most of us, we have never been without our family. It IS unrealistic to expect that you are just going to be okay 100% of the time. It needs to become common knowledge that it’s okay to feel like you’re not loving university all of the time. It’s okay to feel homesick. It’s okay to think what the heck am I doing here and was this the right decision. Because these feelings are normal for a teenager who has never done all this before. Fast forward four years. Last year, I started my Masters. Exactly one year today I moved out again, this time an hour and a half from home. I was 22, and I thought right, this time I can do this. I won’t feel homesick, I’m four years older, I’m not a teenager any more. Once again, I had set up unrealistic expectations for myself. After a few days, I felt that homesick feeling creeping back. The one I’d forgotten for years. I did feel disappointed in myself, I’m not going to lie. I felt guilty that I was there doing my dream course in really nice accommodation with lovely flatmates yet all I wanted to do was go home. Again. But I gradually learned to stop beating myself up about it. If I feel homesick, so what? Yes, some people are further from home than I am. Some much, much further. And they seem to not be missing home at all. However, I realised that nobody knows what goes on behind closed doors. Just because someone looks happy, doesn’t mean that they are. 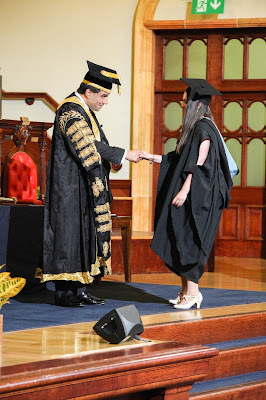 I came home from university most weekends during my Masters – and I have no regrets about it. Some people might think it’s ‘lame’, or stupid, but for me it was a way of coping with my feelings and it made me happy. And at the end of the day, you’ve got to do what makes you happy. Life’s too short to sit around feeling guilty that you shouldn’t be feeling the way you are. You don’t have to apologise for your emotions and you certainly shouldn’t feel like you aren’t able to share how you feel just because society says that you can’t. So yes, I built up my expectations for that perfect university experience twice and they both didn’t match up. 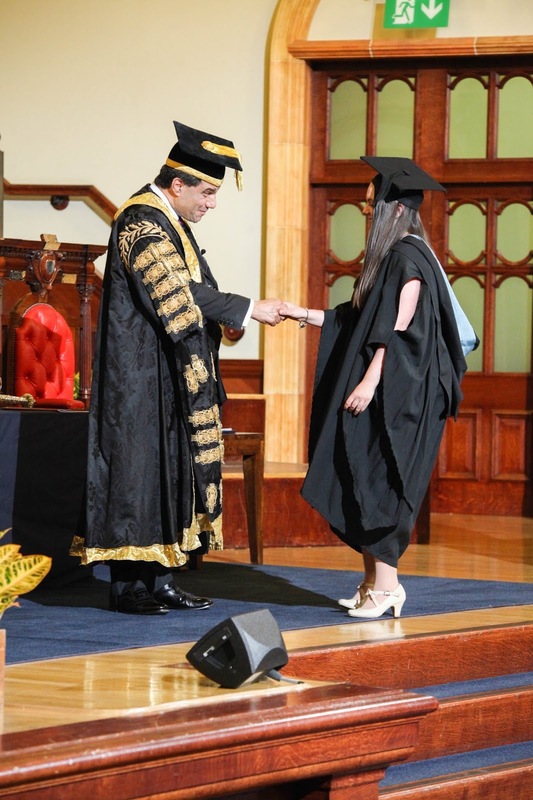 I have to say that a lot of my university experiences were positive – I loved both my courses and I did make some amazing friends. But you can’t help the way you feel when you’re sitting alone in your bedroom away from home. I definitely think we need to change the way teenagers are expected to behave when they go to university. 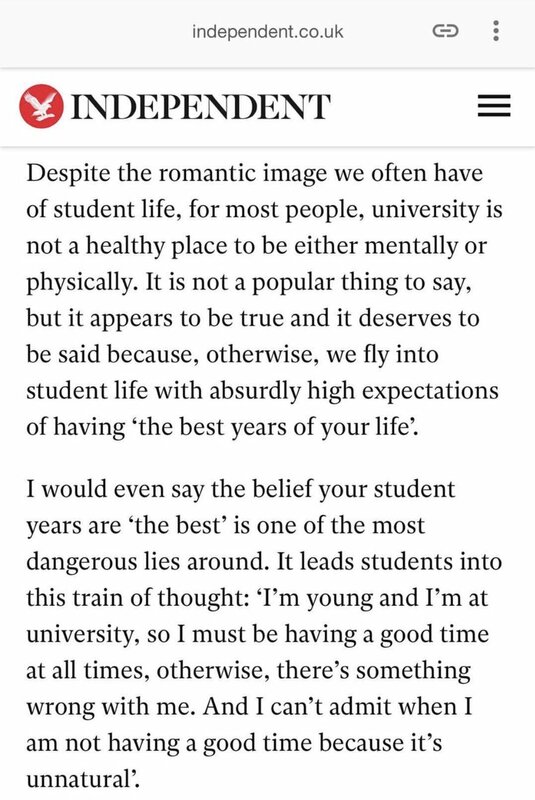 Because as the article that inspired me to write all this said, the belief that your university experience will be perfect is a ‘dangerous lie’. University is an amazing place where you grow and learn and in many ways do have the best years of your life. But it can also be isolating and if you aren’t having as amazing a time as you thought you were, there is nothing wrong with you. It’s totally normal and you shouldn’t be afraid to admit it. 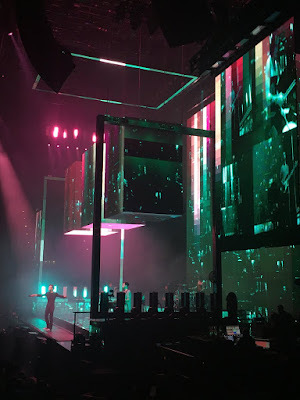 I’m sorry that this wasn’t the most coherent blog post or the most structured, but I wanted it to be real. I have essentially just poured out my feelings onto a page but that’s the most natural way for a post like this to be. I’ve never really expressed these thoughts very deeply to anyone other than my family and extremely close friends, so I don’t know what possessed me to put it out there on the internet for the world to see. I just hope that someone reading can relate to my experiences. Just know that university is a fantastic place – you will have a great time, but just make sure that you give yourself a break if you aren’t feeling it 100% of the time. Have you been to university or are you about to start? I’d love to hear your thoughts on this post and whether you’ve had a similar – or maybe opposite – experience to me! Can relate to this post so much. It's crazy how much is put on your uni experience, and if it isn't working out like you were once told it would, you start to question everything. I was told that supposedly you meet the person you're going to marry when you're at uni, and by no means did I haha! It's all what you make of it I think. Thank you so much for reading! It's great to hear that other people can relate because at the time I felt like I was the only one. Haha, that definitely didn't happen for me either unfortunately! Definitely, everyone's uni experience is different.